There’s a new independent candidate for President in 2016, but can he get on the ballot in time to make a difference?. 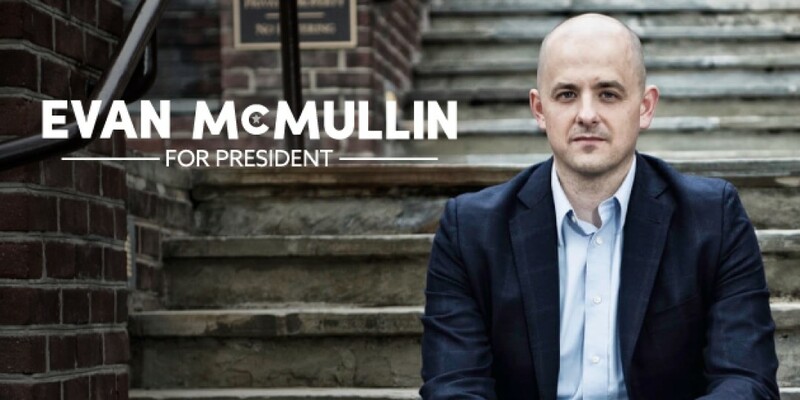 Evan McMullin is a former CIA officer and a fervent anti-Trump Republican. He declared his candidacy today–August 8, 2016. If he wants to mount a serious challenge to Trump, he’s got a big uphill climb. McMullan also has a bit of lead time in several other states. But to be the spoiler in those states, he’ll have to get busy fast. At this stage of the 2016 election, it’s too late to get on the ballot in all 50 states. If it were earlier in the election cycle, that might be possible. Doing that, though, would take a large on-the-ground organization, because there is no central place where an independent, a third-party candidate, or even a Republican or Democrat can just fill out a form to get his/her name on the ballot. You have to do it state by state. And ballot access laws—the rules that govern how one gets on the ballot—vary widely from state to state. It’s also important to note that state laws governing ballot access are skewed toward the established parties—Republicans and Democrats. Third-party candidates or independents not affiliated with a party face additional burdens not required of R’s and D’s. According to Wikipedia, these additional hurdles usually come in the form of “difficult, signature-gathering nominating petition drives” not required of major-party candidates. One other takeaway from this chart: States appear to have granted one concession to off-brand candidates—an extended deadline. You’ll see that the filing deadline for independents and third-parties fall after most states’ primaries and caucuses. That schedule makes it possible for someone like Michael Bloomberg to wait in the wings a bit longer, until the dust has settled from the major parties’ primaries and caucuses, and to assess his chances of jumping in. But there’s still a lot of pressure: Getting enough signatures—valid signatures that will survive the challenge of being checked, one-by-one—can be tricky and frustrating. Here’s the chart. It’s long, but we’re a big country, with a lot of rules. Colorado Receive the nomination of the party's state convention [73 days before primary election]. OR collect 5,000 valid signatures from registered voters. An unaffiliated candidate must be registered as unaffiliated by the first business day in January of the year of the election. $1,000 fee to have name placed on party's primary ballot. Indiana Signatures equaling at least 2% of the total votes cast for Indiana Secretary of State in the most recent election Initial filing with county: June 15, 2016. Final petitions to Sec. of State: July 15, 2016 Collect 4,500 signatures to have name placed on party's primary ballot. Louisiana Petition for placement on the general election ballot or pay a filing fee. 8/16/16 Petition or pay a filing fee to get on primary ballot. ME Sec. of State determines names on primary ballot. Or petition to get on primary ballot. Massachusetts Signatures of at least 10,000 voters. Initial filing: Aug. 2, 2016. Final deadline: Aug. 30, 2016 MA Secretary of Commonwealth determines names for party primary ballots. Or petition. Michigan Signatures of at least 30,000 qualified voters 7/21/16 Names on ballot determined by Sec. of State and party leaders. Or by petition. Missouri Signatures of at least 10,000 registered state voters 8/23/16 $1,000 fee to appear on party primary ballot, or by petition. Montana Signatures equal to 5% or more of the total votes cast for the successful gubernatorial candidate at the last general election, or 5,000 electors, whichever is less. Initial filing: Aug. 17, 2016. Final deadline: August 25, 2016 Collect 500 signatures to get on party primary ballot. Primary candidates determined by Secretary of State. Or by petition. New Jersey Signatures of at least 800 qualified state voters 8/01/16 Collect 1,000 signatures to get on party primary ballot. Oklahoma Signatures equaling at least 3% of the total votes cast in the last general election for president 7/15/16 Signatures of 1% of registered voters in each congressional district, or or 1,000 registered voters in each district, whichever is less. Or, a $2,500 filing fee. Previous Post:What about the freedoms not related to guns?